The place of RuneQuest in the history of roleplaying cannot be underestimated. Originally published by Chaosium, Inc. in 1978, it was the first fantasy RPG to be more of a simulation than a game in its depiction of characters, to focus on skills as a primary means of handling actions and character advancement, rather than the wargames orientated “Class and Level” method of Dungeons & Dragons. It was one of the first fantasy RPGs to written for its own specific, accessible setting, that of Glorantha – the first RPG to come with its own setting was TSR’s Tékumel: Empire of the Petal Throne, which though glorious was hardly ever accessible. In years to come, the mechanics underlying RuneQuest would give birth to Basic RolePlaying and from there to at least ten other RPGs, of which Chaosium, Inc.’s Call of Cthulhu is the most notable. 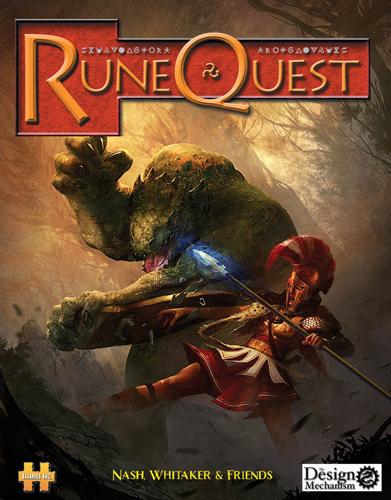 Over the years, RuneQuest has had almost as many publishers as it has had editions. The Design Mechanism is the game’s fourth publisher, and its version, is the game’s sixth edition. It is important to note what RuneQuest Sixth Edition is and what it is not. As a roleplaying game it is a development of the RuneQuest rules, using the same percentile mechanics as did the game in 1978, but what it is not is a game with a setting and certainly not Glorantha, the setting that has been bound up with RuneQuest for much of its history. Indeed, RuneQuest Sixth Edition does not actually come with a setting, but rather hints at one in the various examples that illustrate the game’s rules. This the city-state of Meeros, a late Bronze Age culture beset by barbarian warlords. It would not be unfair to suggest that this late Bronze Age culture is a hangover from previous editions of the game and from the setting of Glorantha itself, which was built around various Bronze Age cultures. Nevertheless, a competent GM should be able to build something of Meeros from the hints given in these examples, but with the rules and mechanics presented in RuneQuest Sixth Edition he should also be able to set his game anywhere from the late Bronze Age up through to the Dark Ages. That said, The Design Mechanism has provided a GM’s Pack that gives both a scenario set in and more details of Meeros. Written by the same team behind RuneQuest II for Mongoose Publishing, RuneQuest Sixth Edition comes as a slab-like black and white softback book. At its core it is a book of mechanics and rules built around a percentile skills system, a fairly deadly combat system, a focus on character culture and affiliations, and of course, a set of integrated magic systems. In retaining all of these fundamental aspects what The Design Mechanism has done with RuneQuest Sixth Edition is make relatively minor adjustments to the rules and mechanics. These will be highlighted as and when they come up in the review. By default, all characters in RuneQuest Sixth Edition are human – guidelines in the Creatures chapter provide means to create centaur, dwarf, elf, and Halfling characters. The process of character generation begins by rolling dice to determine base attributes – Strength, Constitution, Size, Dexterity, Intelligence, Power, and Charisma. From these are derived several factors. These include the expected Damage and Experience Modifiers, Healing Rate, Height and Weight, Hit Points, Strike Rank, and so on, but to these are added Action Points, spent to act in combat, and Luck Points, used to give a character an edge, whether a dice roll, the mitigation of damage or unfavourable circumstances, or a vital advantage in combat. Each character also receives the same set of standard skills, the base value for each one determined adding two attributes or doubling a single attribute. With the base character in hand, a player takes his character through three steps. The first is to select the character’s Culture – Barbarian, Civilised, Nomadic, or Primitive; the second step his Career, the third his Development. At each step a character receives a set number of points to assign to skills, either to a character’s standard skills or his professional skills, the latter type of skill, such as Commerce, Gambling, and Mysticism, gained after years of practice and learning. Some professional skills come from a character’s Culture; the others come from his choice of career. A character’s choice of culture also sets the careers available to him. For example, Crafter, Fisher, and Hunter are available to all four cultures; Herder to all but Civilised; Merchant and Scholar to all but Primitive; and Courtesan and Sorcerer to Civilised only. Although the base values for both types of skills are determined by a character’s attributes, the granting of the same number of skill points throughout the process serves to balance character generation. In addition, a character has several Passions – loyalties, beliefs, and feelings towards someone or something, that are again measured as percentiles and which work in a similar fashion to the Personal Traits of the King Arthur Pendragon RPG. They also do something more though in that they can serve as a resisting value or to give a bonus to an action if said action is dramatically appropriate to the Passion. For example, a character who is subject to a seduction attempt could use the love of his wife to resist the attempt, whilst later he might use the same Passion to grant a bonus to a bow shot to strike a villain who has his wife in grasp and is threatening to kill her. Passions though, are an optional extra, but they do add a depth to a character. A character also rolls for his Background events – he has more of them the older that he is, his social class, his family, and any allies, contacts, and rivals. Our sample character is Hesione, a courtesan in the city-state of Meeros. Originally a slave, she owes her position and freedom to the company that she entertains. Of late, she has also served as an envoy for the lords of Meeros, delivering messages to other city states whilst appearing to be the companion of a merchant leading a caravan to the destination city-state. She is always well dressed and knows how to use her appearance and words to impress and entice. She hides a knife amidst her jewellery and knows how to use the pins in her hair and her clothes to defend herself. Background Event: You have a Rune-shaped birth mark. Looking at the sample character, there appears to be a major omission – the lack of weapon skills. One fundamental change in RuneQuest Sixth Edition is that it discards individual weapon skills, but instead groups them under ‘Combat Styles’. Each Combat Style is a single skill, but each covers the use of three or four weapons, their grouping determined by training or cultural origins. So for example, the Combat Style (Meeros Militia) might cover the use of shield, spear, and short sword, whilst a barbarian horseman’s Combat Style (Steppe Wolf Pack) would cover scimitar, shield, and short bow. In the case of Hesione’s Combat Style (Desperate Houri), the GM allows her to include dagger, knife, club, and improvised weapon. As much as this negates the number of skill points that a player has to assign to individual weapon skills, it raises a number of questions. First, does it really make sense for a character who successfully uses his shield to have a weapon in the same Combat Style also improve at the same time with an Experience Roll? To an extent it does if they are used in concert together, for example, the sword and the shield. Yet what if the other weapon in the Combat Style was a bow – how would that be improved by a character successfully using his shield? In terms of previous versions of RuneQuest this does not make sense because skills under that system were improved through use – use a skill, gain an ‘Experience Check’, and there was a chance that a character would improve the skill. In RuneQuest Sixth Edition, characters receive ‘Experience Rolls’ rather ‘Experience Checks’. Essentially, ‘Experience Rolls’ are reflective in nature, a player taking stock and appraising his actions from the previous adventures. Handed out by the GM a few at a time, they can be used to improve existing skills, increase characteristics and Passions, and to learn new skills and new magical abilities and spells. In terms of improving a seemingly disparate set of weapon skills such as the scimitar, the shield, and the short bow of the Combat Style (Steppe Wolf Pack), it begins to make sense that all three are improved as a character is unlikely to practice in one over the others. In addition, a character could actually go and purchase training for any one of his skills. A nice touch is that characters can also learn a little from making fumbles under circumstances. Another question is , what happens if a character learns two Combat Styles both of which have weapons in common? The advice to the GM is to avoid this occurring, and if it does, to go with the obvious higher skill. As a concept, Combat Styles feels a bit dry, but the later rules expand upon the basic concept to add traits such as ‘Intimidating Scream’ and ‘Shield War’. These add flavour and feel, and give more variety. RuneQuest Sixth Edition is a percentile skill system. At its most basic, a character just needs to roll under the skill, but various difficulties are listed. These range from Very Easy (double skill value) and Easy (add half the skill value) to Hard (reduce skill by one third), Formidable (half skill value), and Herculean (half skill value), which all feels a little complex. An alternative and simplified set of modifiers is also given, but even so, a GM’s screen would make their use easier. Overall though, the number of skills available have been streamlined, giving the game a less cluttered feel. That said, one element that has been removed from RuneQuest Sixth Edition is the use of attributes in play. No longer are there raw Strength or Constitution tests, opposed or unopposed, which also means that the Resistance Table is also no longer present. In their stead are skills such as Brawn and Endurance for example, with players needing to make those skill rolls rather than rolls on the Resistance Table with the degrees of success determining how well a character does. To anyone familiar with the RuneQuest mechanics, this may seem an odd choice, since the Resistance Table has been part of the rules for numerous editions and also the system’s later games. It is an elegant solution to using the Resistance Table though, which can be a little fiddly to use in play, but at the same time, it does reduce the use a character’s attributes bar the determining a lot of other factors. The changes to the combat rules for RuneQuest Sixth Edition continue with the adoption of a freer flowing feel. This begins with a more traditional initiative system, now a simple roll of a ten-sided die plus the character’s Strike Rank. What a character can do and how many times in a round is determined by how many Action Points he has. This includes having to take defensive actions, such as parrying, so players are probably going to learn to spend their Action Points wisely. The combat rules are detailed in that they allow for the effect of weapon sizes and reach, and they also allow for a certain degree of tactical, if not cinematic, action. Essentially, rolls are differential in that the degrees of success between an attacker’s roll versus the defender’s grant certain ‘Special Effects’ that replace the old Impale and Critical effects. The combatant with the greater differential, that is, has rolled more degrees of success actually chooses what ‘Special Effects’ he wants. This includes defensive rolls such as Parry, so if a defender rolls better than his attacker, he can generate Special Effects to his benefit. Over all, this allows for more interesting combat than in previous versions of RuneQuest. For example, Hesione is travelling with a merchant caravan that has been attacked by Orc bandits. Alaric, the Shaman in training, is out with a scouting party that comes across this scene and with the rest of his fellow riders charges down the marauding Orcs, marking one Orc as his intended target. Both make Initiative rolls. Alaric rolls a 10 and adds it to his Strike Rank of 10 (normally 15, but adjusted for the scale armour he wears) to get 20; the Orc rolls a 3 and adds it to his Strike Rank of 8 (also adjusted for his armour, in this case, furs) to get 11. Obviously, Alaric is going first and uses the first of his 3 Action Points to ‘Change Range’ and charge the Orc down. The Orc is not surprised – the sound of horses’ hooves is not something he can ignore – and first uses a free action to ‘Ward Location’ and lift his target shield so that it covers his head and upper body where he thinks that Alaric will try and strike with his scimitar. He then uses a Delay to hold his Parry until Alaric attacks. This costs him the first of his 2 Action Points. With his second Action Point, Alaric attacks, using his Combat Style (Barbarian Horse Warrior) 48%, whilst the Orc will defend himself using his Combat Style (Orc Raider) 62%. Alaric rolls 03%, whereas the Orc rolls 56%. Both are successful in their actions, but because Alaric has rolled a Critical versus the Orc’s ordinary Success, he gets to select a Special Effect in addition to any damage done. Both Alaric’s scimitar and the Orc’s short sword are medium-sized weapons, which means that the Orc can block all of the damage that Alaric would otherwise inflict. Nevertheless, there is the matter of the Special Effect to take into account yet, for which Alaric selects ‘Disarm Opponent’. Although the Orc blocks Alaric’s blow, he cannot stop the scimitar from sliding down to catch his fingers and force him to drop his short sword. Alaric still has an Action Point to spend and decides to attack again, this time rolling 16%, whilst the Orc uses his last Action Point to try and block the blow with his shield, rolling 80% and failing! This grants Alaric another Special Effect, which his player decides will be ‘Choose Location’, meaning that Alaric can strike somewhere not covered by the Orc’s shield, in this case the Orc’s right or weapon arm. He rolls 1D8 damage minus his Damage Modifier of -1D2, for a total of 6 points of damage. The Orc’s fur armour stops 1 point of this, but 5 points get through, reducing the Orc’s Hit Points in this location to -1 and inflicting a Serious Wound – the Orc is in trouble! One issue that the example does illustrate is the importance of the Action Point economy. Whilst it works well, it illustrates the difference between having three Action Points per round and two. Arguably this is a balance issue and it may not be to everyone’s tastes as every player character either begins the game with two or three. This issue is discussed in the GM’s chapter, but ultimately it is one mechanic that the GM will have to address. One quarter of RuneQuest Sixth Edition is devoted to magic, or rather, to the basic concepts of magic followed by five types of progressively more complex magical disciplines – Folk Magic, Animism, Mysticism, Sorcery, and Theism. Folk or ‘Common’ Magic is the simplest, and is the magic of simple cantrips to aid in daily tasks and of hedge wizards and witches. It includes classic spells such as Bladesharp and Deflect, Light and Glue, representing widely available if low-powered spells. Animism covers how to contact, negotiate, combat, exorcise, and bind spirits, using the skills of Trance and Bind. The former skill allows the user to enter and move around the spirit world, while latter allows the user to persuade or force a spirit to act for him to grant various spell-like effects. Mysticism employs Meditation and Mysticism to learn and employ Talents such as Astral Projection, Life Sense, Attribute Enhancement, and so on in very personal form of magic that feels akin to traditions of the Far East. Sorcery is the direct casting and manipulation of magical effects and thus to an extent reality using Invocation and Shaping, and is perhaps the most studious of the five discipline. Lastly, Theism employs the skills of Devotion and Exhort to call upon a god or gods for magical aid. Although magic in RuneQuest Sixth Edition is fundamentally derived from the Runes, there is a clear effort with the five disciplines to present very different approaches to magic. Conceptually, they are perhaps the most complex aspects of the new rules, but these rules work hard to keep them as simple as possible whilst still retaining a great deal of flavour in their details. The toolkit aspect of RuneQuest Sixth Edition means that by choosing the types of magic available in his game, a GM can actually define much of the flavour or feel of the setting he is creating. Our sample magic using character is Alaric, shaman in training to his tribe. He is unsure of his calling, but he is his grandmother’s choice to become the tribe’s shaman after his father dies. Indeed, his grandmother’s spirit is bound into a fetish that he wears around his neck. His next task is to find a wolf spirit, wolves being held in high regard by his tribe and learn to become one with his spirit. Background Event: I am under a divine curse… I will moan, groan, and whinge at every opportunity, or remain completely stoic at every misfortune that befalls me. If character generation made much of a character’s Culture and Community, essentially his background, then the rules for organisations – ‘Cults and Brotherhoods’ – develops it for use in play. Cults have always been part of RuneQuest, but in previous editions of the game they were tied to its original setting of Glorantha. Here they are expanded to cover organisations of all kinds, ones that characters can join and progress through the ranks of, gain training and gifts from, and work for. Primarily they consist of cults attached to one of the magic disciplines, but they could be military units, criminal gangs, and so on. Numerous examples are given, these nicely providing in-game physical support for the GM and players alike and further strengthening the role of magic in any setting that the GM creates. More specifically for the GM are the last two chapters. The first of these is a bestiary which includes a range traditional fantasy RPG creatures, such as Dragons, Ghouls, Ogres, and more. Many also have come straight out of Greek Mythology – Cyclops, Gorgons, Harpies, and so on, which further supports the implied setting of Meeros and the Bronze Age setting as well. Other creatures are oddities, such as the Acephali, headless and neckless humanoids that have their in their chest; Bonacons, bull-like creatures with horses’ heads that excrete a nasty poison; and Slargr, intelligent, bipedal lizards that are highly territorial and eat anything. The creatures are supported by excellent guidelines on using in the game and how to turn them into player characters. The last chapter is dedicated to ‘Games Mastery’. This covers everything from general Game Master advice to actual advice particular to RuneQuest Sixth Edition. In places it answers the queries raised through reading the rules, but for the most part it addresses elements of the rules from the Game Master’s perspective. Although there is useful material here, it does feel underwritten and what it really lacks are guidelines on setting creation, or at least a sketched out sample setting. That way, a GM could see how the rules in RuneQuest Sixth Edition could be applied. This would not be an issue if RuneQuest Sixth Edition was just a set of rules – there is an implied setting in the book and it is a pity that there is not more of it, although the GM’s Pack available to download from the publisher’s website for free goes some way to address the lack of a setting. Physically, RuneQuest Sixth Edition is decently produced. The cover is particularly good, showing a Greek hoplite warrior facing some giant creature – actually a Slargr – and is reminiscent of the cover to the original RuneQuest cover from 1978. The internal illustrations, all black and white, are not all as good as the cover. The layout is clean and tidy though, and the book for the most part is well written. In places the book could have been better organised, for although there is an index, having to flip back and forth during play may be an impediment to play. Also, some of the examples given do feel more like narratives rather than full rules explanations which are disappointing. With a game as old as RuneQuest, it is no surprise that there is a sense of nostalgia in coming to RuneQuest Sixth Edition. Yet whilst RuneQuest Sixth Edition retains much that made the original so very different from RPGs of its era, The Design Mechanism has streamlined the rules and worked hard to make the game easier to run. It has adopted more modern sensibilities by including more modern rules to strengthen each character’s drive with the rules for Passions and by giving a means to cement each character’s place in the world with the rules for ‘Cults and Brotherhoods’. The combination is a tried and trusted RPG that has been updated without the need for radical change, a combination that long time RuneQuest devotees will recognise and enjoy playing, and a combination that anyone new to RuneQuest will not be overwhelmed by the game’s past. Either way, what shines through in RuneQuest Sixth Edition is a feeling that the RPG is whole once more and in the hands of a publisher that loves the game. An excellent and informative review! Very useful review, giving the right amount of detail. Based on my reading of the book, I would say this is an excellent and accurate review. What killed Dungeons & Dragons?